It has been awhile since blogging (as of lately) but I sure miss it! I am not going to commit to posting on a consistent basis, yet it is something that I want to try to incorporate into my life more because it is good for my soul. Additionally, I feel I have experiences in areas that could benefit others. So with that I am going to jump right in! Today I want to discuss a topic that I have recently been walking through. As a person who struggles with managing bipolar disorder, one aspect of treatment that I require is medication. For that medication I have to meet with a psychiatrist on a fairly regular basis. Anywhere from every couple of weeks to every three months if I am in maintenance. In the last ten years I have seen five psychiatrists and I have an appointment the end of this month for an evaluation with a new one. Why so many you might ask? Well the first misdiagnosed me and put me on medication that drastically made me worse. At the time I was only 16 and they really had no business treating a teenager, but my parents and I didn’t know any better. That could be an entire topic on its own. (Side note, if there is ever a topic that you want me to discuss I am more than happy for the suggestions. I do have an interest in speaking with parents of teenagers or young adults to help them walk through this journey as a family as well. Okay back to me.) The second psychiatrist correctly diagnosed me and I stayed with this one for several years. Eventually I realized I was over-medicated and there was no room for discussion on a reasonable level. I was feeling very unheard. I had an instant connection with the third, but they took a job in a different location which wouldn’t accept my insurance. The joys of the medical system here in the United States. The next psychiatrist I didn’t really connect with, but they listened to me enough and I was able to be remain stable for a couple years. Unfortunately, they had personal reasons and left practice. Between that one and the fifth, I was off medication completely for a year. There are periods of time where I am able to be off of medication. Slowly and surely though as the months progress, I have a slow and steady decline until I find myself in desperate need of stability. I have been through the cycle of on again off again meds three times and every time is the same. This last time made me realize and finally accept that medication is just going to be part of my life. I have done a great deal to work with my symptoms without medication and I am someone who needs that little extra boost to make my life go from okay and unbalanced to stable and great. So with that notion, my therapist recommended the fifth one and I have seen them for the past three months. While they are very knowledgeable and we get along okay, I have been around the circle enough times so to speak that I need a little more from someone who is going to effectively manage me for hopefully years to come. Someone to work through issues with me and actually listen to my perspective on how the meds are or are not helping. It is very important to have that two-way form of communication and especially important that you are able to speak up and be assertive when needed. Psychiatrists may hold the “power” (or I like to think about it more as the knowledge) about how and when they prescribe certain things, but you have the power to choose someone who is going to work with you as a team. Find the right one, even if it takes time because with a chronic condition you will want someone in your corner who can form a lasting relationship to make your life the life you want. You are the one that has to deal with the treatment and side effects. They get to go home at night to their life without thinking about your life unless you are in their office. It is only fair you choose one that gives you that undivided attention at your appointments that you need. I am still in the searching phase, yet I have worked with enough psychiatrists to know that there are ones out there who fit my needs. It takes some patience and I don’t always have the patience or stability which is where the assistance of a therapist or other doctor is crucial. You can’t do this alone. Medication can be a valuable tool in the treatment of any illness, mental or physical. The stigma that we don’t need medication is harmful and downright dangerous at times. I understand that access to psychiatrists and medication can be a challenge, so find someone who can advocate for you whether that is a therapist, another doctor, even a friend. If you have a crappy psychiatrist or you just need a change – do it! Do not feel obligated to stay with a certain doctor if you don’t like them or they do not fit your needs. We need a team and you need to be able to communicate effectively with each other to make your life stable and enjoyable. Maybe you don’t need to be on some medication now, but it is still a good idea to have a psychiatrist to talk through the symptoms and so they can be there if or when needed. If you are prescribed medication, please take them correctly and on schedule! Don’t go off without talking to a professional just because you feel better or you don’t feel a change. Withdrawal is no joke on some psychiatric meds and trust me going through a small titration, again with a professional, can make that transition the best a situation it can be (still never fun though). If you don’t take the meds properly, they will not work correctly and you won’t get a chance to see if there is a potential for positive change. If your current psychiatrist is working out great for you and they suddenly have changes that won’t allow you to see them anymore, remember they are human beings too with a life outside of their work. It is the hardest when you lose a professional you connected with, but you need to move on and pick yourself up right away to make sure you stay stable and healthy. This situation was very hard for me to deal with and although uncomfortable, moving on to a new one is just what needs to happen. 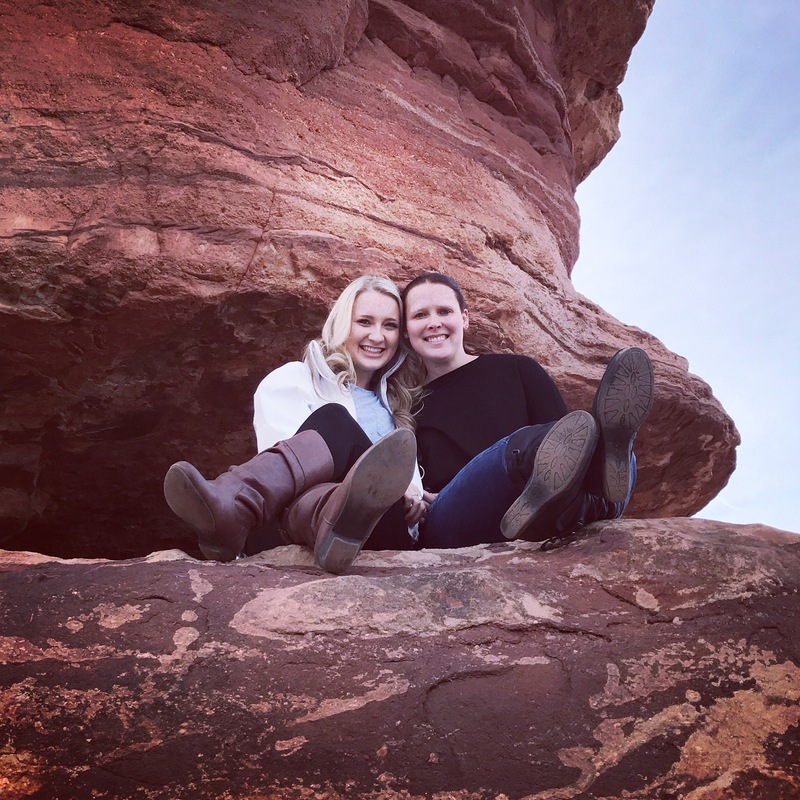 Bottom line: life can be difficult and unpredictable with bipolar disorder or any mental disorder, but in my experience medication has helped me resume a more normal and enjoyable life. I hope it can for others as well. I am not dismissing the fact that it is difficult to start or change a psychiatrist, but I am here to tell you that you are definitely not alone and millions of people are walking through this same process on a daily basis. Find community and connection and most of all find a treatment team that has your back every step of the way. In a few weeks I hope to update you with good news that this new one has the potential to be in it with me for the long haul. I realize that was a long-winded post but I hope it gave you some perspective on working with a psychiatrist. Have a great weekend! I thought it might be helpful and fun to do some questions about me since I haven’t been around much recently and would like to re-introduce myself to new and old followers! My full name is Alexandra, but I have always preferred Alex. My zodiac sign is Libra and although I can be a skeptic, a few traits of a Libra do seem quite fitting- cooperative, diplomatic, indecisive, avoids confrontations, likes harmony and the outdoors. Lack of control (this manifests the most when flying), my dogs somehow getting loose and running off, running out of gas/flat tire/car problems in the middle of a freeway. My best friend is truly my person and I wish we lived closer! But we do stay in contact daily. Tiny Dancer – Elton John. I am determined to get tickets to his Farewell tour. Fuzzy orange and blue – fun fact the question was originally color of underwear but really I love socks way more! I have 4 tattoos so far. I have 4 piercings in my ear although I really want more! Unfortunately my body easily builds up scar tissue and I get keloids. I had a helix piercing that developed a keloid scar formation which I had to have surgically removed. At the time my mother wouldn’t let me get any more piercings and although I would like to try another one I don’t exactly want to pay for any medical consequences! I started blogging as a personal resource for writing. I started this blog while I was recovering from an eating disorder and although I haven’t been as active recently I would like to continue to use this platform for personal writing and mental health advocacy. Right now I feel a bit lazy but I am enjoying every minute of it! It is a Saturday after a long work week and I am lounging in my sweats, sipping coffee, writing and thoroughly enjoying my afternoon. I really really want a king size bed. I like to spread out and having two large shepherd dogs hinders that ability currently! A large component to my recovery and my life is to practice mindfulness. It grounds and calms me. My favorite animal and nick name is Penguin so my URL describes how I want to live life. By being a mindful penguin! I watch a lot more TV shows, but I would have to say one of my favorite movies is Interstellar. I like movies that make my brain hurt and make me contemplate life on a grander scale. Music means the world to me. I will never be able to have a favorite song, but lately my favorites have been “Dark Side of Me” By Coheed and Cambria, “I Hold On” by Dierks Bentley, “Car Radio” by Twenty-One Pilots, “Lydia” by Highly Suspect, “Broken” by Falling in Reverse, “Oceandust” by Hands Like Houses, and “Euphoria” by Polyphia. Again I refuse to have a single favorite. Besides the bands above I am a big fan of Evanescence, Panic at the Disco, Blue October, Paramore, Breaking Benjamin, Scary Kids Scaring Kids, Chiodos, Disturbed, Stone Sour, Halestorm, Our Last Night, Red Hot Chili Peppers, Three Days Grace, Skillet…..okay I will stop now, but seriously music is life. My person and my momma. Both live in different states. The man sitting next to me studying. I have a very strong relationship with both my parents. My favorite holiday ironically is Thanksgiving. I say ironically because a few years ago it was my worst nightmare. Recovery is worth it every day! I love being around family and preparing some of my favorite foods during this time of year. I hate milk. I can’t even have it touch my cereal. I can only drink it if I put chocolate protein powder in it or it is in something like my coffee or smoothies. And no other types of milk – coconut/almond etc – don’t cut it either. Currently in my household there are two german-shepherd/husky mixes, one orange tabby cat, a ball python, a very angry bearded dragon, and many African Cichlid fish. 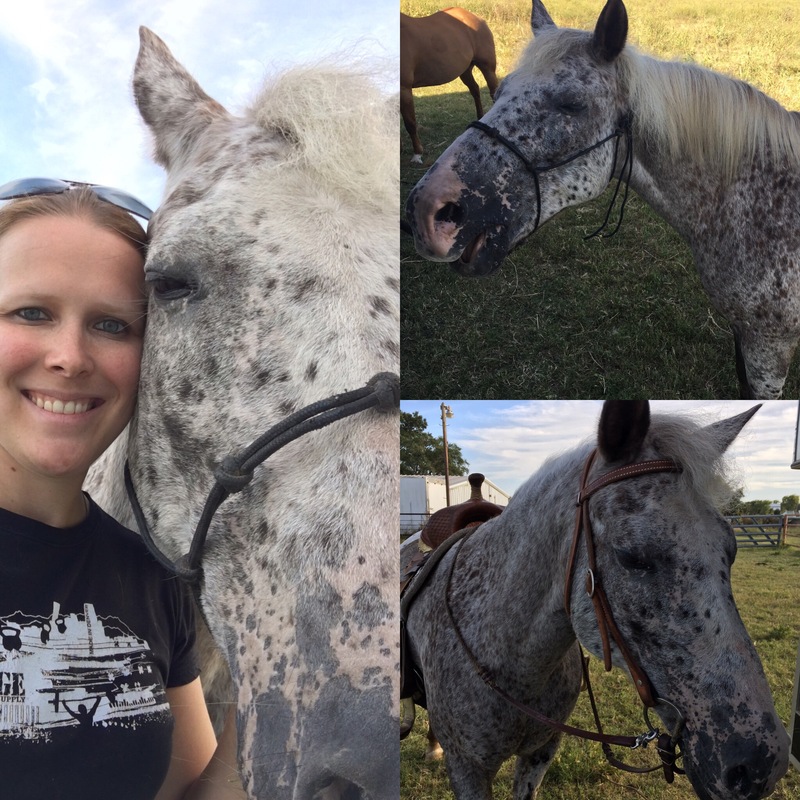 My mom also has a ranch and I consider all my horses (20+) my pets too, especially my appy. Honesty is very important to me. In the depths of my eating disorder I could be a very deceptive person. During college after one of my foot surgeries I was on crutches and my friend dropped off coffee for me during class. It was early on in the semester and I didn’t really know my classmates well and I ended up spilling the entire thing in the middle of the floor and some on the person in front of me. But since I could’t walk, I had to have people help me to clean it up and there were no paper towels to be found in the bathroom at the time. It took this poor girl 5-10 minutes to find a janitor – all while the professor never skipped a beat and kept lecturing. I am pretty sure I always had a thermos with a tight lid from that point on. I work as a research coordinator in orthopedics. Generally work projects are constantly on my mind, but I try to slow down to be mindful and clear my thoughts in those moments when I start to feel overwhelmed. Morning coffee, making to-do lists, watching you-tube while getting ready in the mornings. To own my own house and advance in my career. I fantasize a lot about traveling. Right now I fantasize about places like Norway, Germany, Australia, New Zealand, Japan….I could go on and on. My favorite store is probably Whole Foods haha. I spend a lot more money on food than other things! Avocados, peanut butter, green chili, pasta…I like most foods. My favorite meal though is probably Chicken Malai Tikka from a local Indian Restaurant. I worked most of the day and then spent a nice evening in cooking minestrone soup and grilled cheese. I watched some episodes of the Cosmos and spent quality time with my family. I am a competitive jump roper and have competed at the World level. Take out food, a good tv show, my dogs snuggled with all of us on the same couch. Besides the past question with the famous people I would date….I have a huge celebrity crush on Demi Lovato. I don’t have a favorite blog because everyone has a very unique individual platform and I love reading different life perspectives. Can I answer with the number of dogs I want?! Being serious, I know I don’t want more than three kids. I love tequila. I do enjoy drinks but I hate being drunk. I don’t smoke. Well I hope these small little facts helped you learn a little more about who sits behind this keyboard! Feel free to ask anything else that comes to your mind or I would love to read other people’s answers to these in their own blogs! A new hard drive in my personal computer which is allowing me to get back to the swing of more personal writing. Much love to my man for working on this for me! A beautiful fall day with endless colors, making way for the first snowfall of the season tonight. My person who took time out of her busy schedule to fly home to surprise me and share margaritas with me for my birthday. A job I love and learn from daily. Every time I get to be in the OR observing clinical trial surgeries I feel like a little kid with so much excitement bursting forth. Vanilla bean lattes. I can’t pass up coffee and I had one of the best lattes ever last weekend in Nashville. I am already planning to go back! This time of year is difficult and after finding myself stressing and full of anxiety, just pausing for these few minutes to think about things I am grateful for has allowed my mind to slow. Now I can breathe and relax before starting another week. I hope if you are reading this you will take some time to clear your mind and think about five things you are grateful for too. I have spent the past several months writing and editing my master’s thesis so any other form of creative writing or blogging completely fell by the wayside as plenty of you had noticed. It has been about eight months since I have touched or posted anything on this blog and I miss it! Writing, painting, and reading have been at the top of my list now that life is slowing down a bit. Here is a brief rundown of the past few months! August – I stepped away from the blog for a bit because I needed to put all my writing energy into my thesis. (If anyone has an interest in that I will post my abstract and a little more about what I did the past two years). I wanted to see if the six-minute walk test was a valid test to predict peak oxygen consumption in cancer survivors compared to a treadmill test. Conclusion – the walk test is not valid in cancer survivors who have average or higher levels of functional capacity. I will present my findings this year at the annual American College of Sports Medicine Conference (ACSM). Last August I was continuing data collection and starting to draft out my thesis document. I was also gearing up for a very busy semester with courses like cardiac and muscle physiology. September – School was immensely busy and I was there pretty much 24/7. I was still commuting an hour plus one way so it was often draining and coursework was demanding. I enjoyed classes though. I spent much of this month preparing for October though. October/November – I finished data collection on my thesis and began to look at analyzing the data for my abstract. 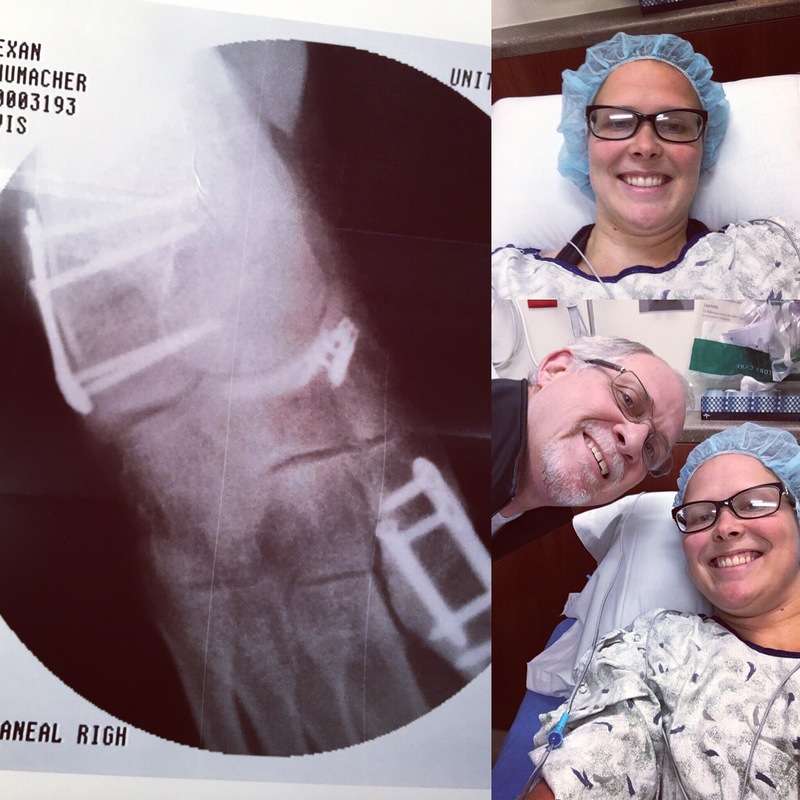 After several months of debating, I undertook another major foot surgery in October to correct my alignment. The technical term for those who care was a calcaneal osteotomy with a tendon transfer. It was not pretty and I was very unprepared for the actual recovery. I am solely to blame because I went in thinking it was just another surgery and I would be back in no time. I have been an ortho patient so many times in my life that I guess I took this one for granted. I have had a spinal fusion, yet this was the worst surgery recovery to date. Add in the fact that fall is not the best time of year for me mentally and it was a rough six-week period. Thankfully my family took amazing care of me and my dad even drove me around to school during this time! 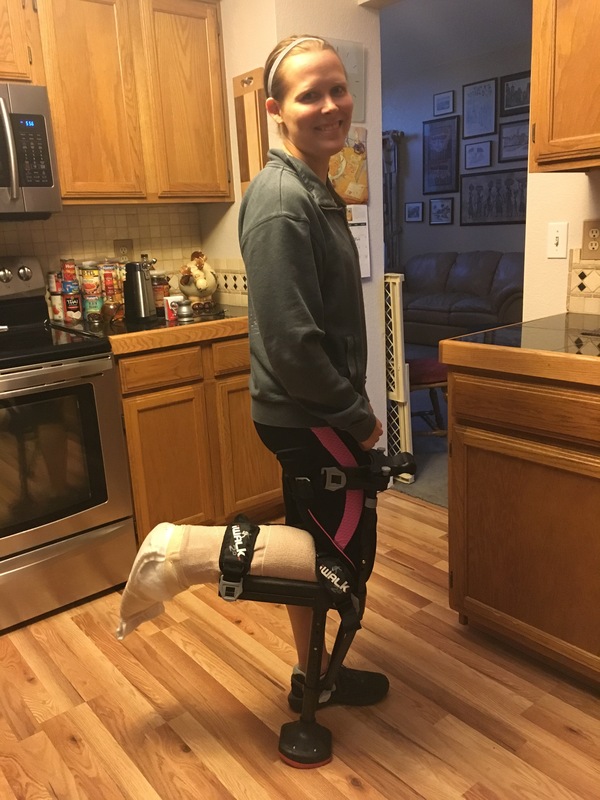 I was non-weight bearing for a couple months but I was sick of crutches and tried out a new fun walking “leg” which allowed me more freedom to shop or walk around. During this time I didn’t work on my thesis a ton, I was just focused on my classes. Looking back now, I am still not sure it was worth it to go through with the surgery, but I still have 2-3 more months before I am close to one hundred percent again so we will see. This was the first scenario though where I realized that I have truly recovered from the eating disorder and that if I can handle a few months like that then I can handle anything. 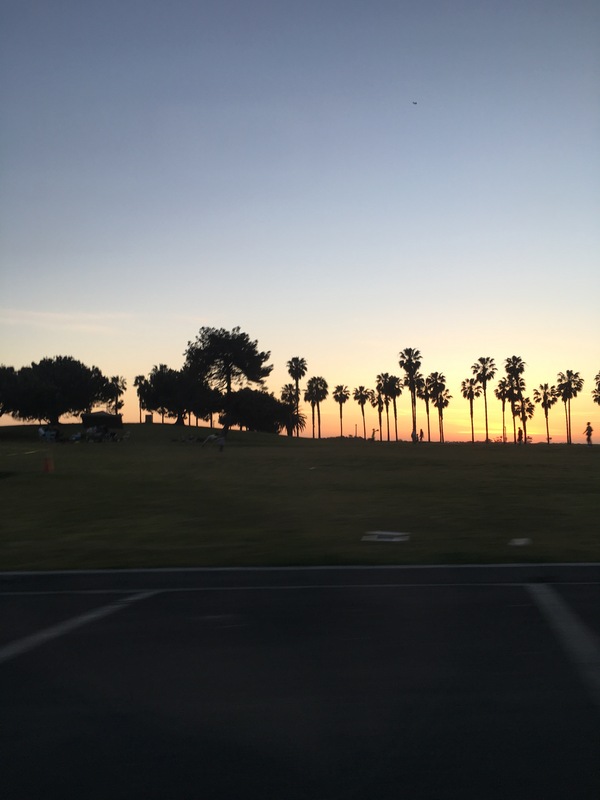 December – I started to feel better and was relieved that fall semester was out, although this is the time I geared up to write. It was almost a good thing that it was winter and I couldn’t walk so I could write a large portion of my draft. The holidays used to be a big problem for my eating disorder recovery, but they honestly keep getting better and better with every passing year. January – New year and a new walking boot. It was a great relief to start walking and driving again. I am very independent and having that freedom taken away was just plain torture some days. I also began a new semester finishing up writing and an online statistics class. I visited family in Oklahoma and started to get a little panicked that I was graduating so soon. February – While all of the things surrounding my surgery and school were going on I should also mention I had been on the job search. In February I officially accepted an offer as a full time professional research assistant in sports medicine. This month was full of excitement as I finished my draft and started to continue editing with my advisors. I was also able to find time to spend with my sister and it was unseasonably warm for February! March- I officially started my job and absolutely have loved every aspect of it! I had my thesis defense and turned it into the graduate school for review….party!!! I had a quick business trip to San Diego and enjoyed some sun and relaxation away from thesis work. Every day I wake up generally in awe of where I am in life today. No one who knows me is surprised in the least bit, but I still surprise myself. It was a challenging academic year and to see the light at the end is very sweet. I graduate in a month and I am definitely looking forward to some down time that doesn’t involve academics. I have a long list of things I want to do this spring and summer. Lots of hiking and camping especially! I tried to keep this a bit brief just for an update and want to post more frequently in depth on topics as they come up. I want to keep mindfulness and mental health priority topics on this blog. Even though I am recovered, I want to support anyone struggling and hopefully be a source of positivity that full recovery is possible and sustainable. Take care! I apologize for not posting more frequently about the mindfulness series I started to discuss. I have had to take a step back due to a couple of injuries and the start of my second year in grad school. I haven’t felt very motivated to write and I realize that it is perfectly okay to take time for myself. Although I want to keep up with writing, I am not going to set deadlines or expectations for the blog. Thanks for your understanding and patience! I am taking a short break from my mindfulness series to do a bit of a reflection. Three years ago I had my spinal fusion surgery. Reflecting over the past three years really makes me sentimental. Going into that surgery was terrifying. What if this? What if that? I had painstakingly gone through the process of finding the right surgeon for me and one who believed I would get back to my old self. There was no hesitation and his confidence allowed me to let go of my own fears and literally put my life into his hands. I cannot stress to you enough the importance of a second, third, or fourth opinion. And I cannot stress to you enough the importance of rehabilitation after the fact. Since my surgery three years ago I have once again competed at a national level, have had the ability to go on 12+ mile hikes, taken part in crossfit workouts that include Olympic type lifting, continued to do light gymnastics tumbling, have had the ability to be on my feet all day whether at a museum or other event, and I could name a hundred more. Pain free through it all! Of course I can get sore on occasion if I overdo it, but doesn’t everyone? I learned how to listen to my body. I learned patience and perseverance and vulnerability. I have since recovered from an eating disorder because this surgery allowed me to realize how much of a hold it still had on my mind when I was forced to give up daily exercise. I started graduate school and am on a path towards a career I am passionate about. I have grown so much as a person and I continue to strive towards what makes me truly happy. It was nowhere near easy, but it changed me as a person and really had an impact on my life that makes me thankful I had to go through it. If you are in the midst of a difficult situation in life, keep enduring. Take it that one day at a time and soon you will look back and realize things are for the better. Everything takes time.